I am a bit of a nerd when it comes to airplane cabins and their changes over the years- particularly first class cabins. With all of that known, there is one cabin that is somewhat sentimental that I am having trouble tracking. The AA 767 which was delivered to AA in the early 1980s, and its interior changes over the years. 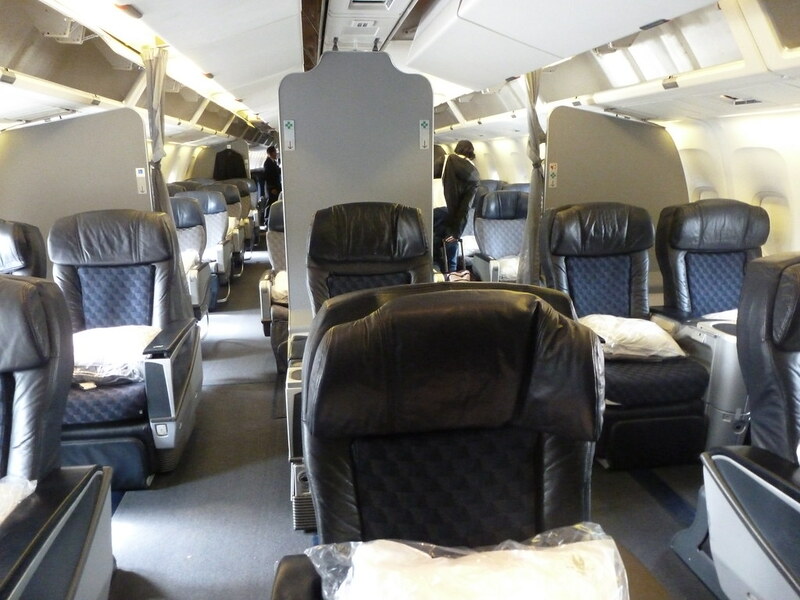 The first time I flew in first class was in 2007 when I flew LAX-JFK on an AA 767-200. It featured the old first class cabin with 9 seats (strangest layout I have ever studied) and the seats were Weber grey leather seats that I believe had been reupholstered from the previous sheepskin days. It was most likely the very end of that seat's era as the new non-fully-flat all business class seats would come in 2008. Here is how I think it went, but any help and or photos would help put this to rest. It also gets confusing because they introduced the 767-300 along the way in all of this and that would end up having different cabins as I understand. Please school me- particularly on the early years! Interesting. Thanks for the timeline and for the pictures. By looking at my username, it is needless to say I have flown on a lot of those since the late 80s when American started flying the 767 on TATL routes to Europe. I do not doubt about your knowledge but I just want to point out that in the 80s and 90s the leather seats in F and C cabins were light brown, not gray. I remember very well. And it wasn't just on the 767s that they were brown, they were on all other aircraft as well. It is at this point useless to modify the F Class seats again, there would be absolutely no point in doing so, since the 767s are on their way out with the last one scheduled to leave the fleet at the end of 2021, beginning of 2022 at the latest. Nice review. Thanks for posting. Thanks for the response! Great that you get to fly them- a beautiful bird. I doubt they'll do any more mods to the cabin- as you said it is going into retirement soon. I believe the 767 got the ETOPs certification in 1985- shortly after delivery to AA (a few years later). I'd still kill for some era photos as the older cabins are very hard to find pictures of! So from my experience, the 762 & 763 diverged in that the 762 never was updated beyond the ‘99-‘08 seat you mentioned, and also that the 762 had a 1-1-1 F cabin and a 2-1-2 J cabin through it’s retirement around 2012/2013... the 763 tracks closer to your timeline in my experience but I seem to recall flying the new J configuration “sleepers” as early as 2015 on a JFK-MAD flight, I was a little curious to see the adapted lay flat seat they had installed vs the 773j seat. the 763 tracks closer to your timeline in my experience but I seem to recall flying the new J configuration “sleepers” as early as 2015 on a JFK-MAD flight, I was a little curious to see the adapted lay flat seat they had installed vs the 773j seat. AA began installing the new J product on the 763 in 2014.
and also that the 762 had a 1-1-1 F cabin and a 2-1-2 J cabin through it’s retirement around 2012/2013.. Pretty sure it was 2-1-2 in F (the with the captain kirk middle seat) and 2-2-2- in J. Honestly - working from memory, so quite possible.. on J I think your right, 2-2-2 makes sense, on F, the only references I can find via google are and f count of 9 on the 762.. how did they set that up? As a kid I remember flying LAX-MIA with my parents on an AA 767 around Thanksgiving 2000. Not sure if it was a -200 or -300. The flight was continuing onward to FRA. I remember being taken aback at how spacious F was and am almost positive the seats there had some sheepskin/leather upholstery combination. 2-1-2 was the layout, but IIRC there were more than 9 seats in F; DepartedFlights shows an AA 763 with 15 F seats circa 1995. I just want to point out that in the 80s and 90s the leather seats in F and C cabins were light brown, not gray. I recall those seats as well from several trips in that time frame to SCL. I think in some light, or perhaps variation of leathers, the light browns could be construed as a "putty" color, or greyish. either way, those seats were darn comfortable for their time. There were 10 seats. It's in the picture in the first post. The only pic with 1 seat in the middle. I remember flying the AA 767s and 763s after 2000, starting in 2002 to 2008 mainly. My first time flying the 763 was in August 2002 on DFW-HNL and had the newer blue seats with adjustable headrests but older bulkheads (1980s looking with clouds, looked like out of a cartoon.) The J cabin had the updated recliners which I traveled in from time to time and were very comfortable. 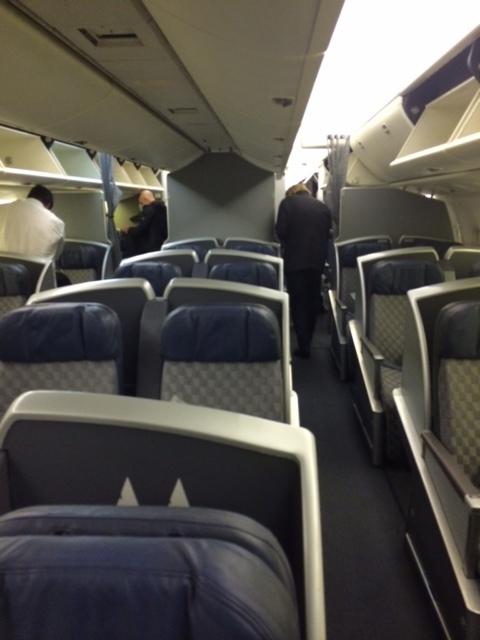 Prior to that, I have no idea when AA replaced it's older coach 767 seats with the blue ones. Was it like 1997-1998? Also anyone remember when AA installed PTVs on their A306s and then ripped them out? Check out this oddball seat color scheme, and those screens were huge for the time! It always puzzled me that AA installed PTVs in their TATL-configured A300s but never did the same in the 763s. 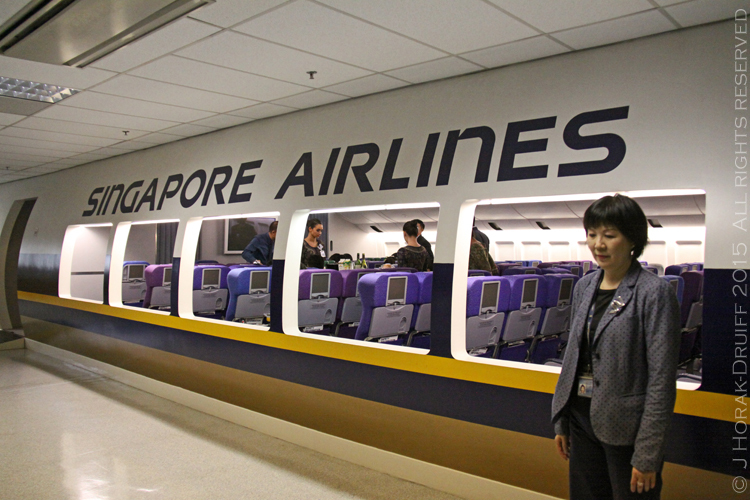 The new-batch 763s came delivered from Boeing with the 777-style interior and came equipped with equipment for PTVs in Y (handsets, underseat IFE boxes) but they never came through with installing them. I know the 763s were 3-class at one point as well. When was F removed? And didn't AA had different overhead bins in J vs. Y? It looked like two aircraft joined together. You are both almost right. The first class seats were taupe. gray with a tinge of brown. Here’s a link to a non-767 example. AA was cash strapped at the time. That would've been like 11 aircraft at most for the 763. The new models did get delivered with IFE boxes for them below the seat. AA actually never addressed why they ripped the PTV out of the A300 after they pulled them off the LHR routes (odd choice for TATL to LHR to begin with.) I believe it was for weight saving reasons. I must be old. I remember flying the 767 in the 1980's when Luxury Liner was proudly painted on the front side of the plane. They were luxurious at the time. This was before the rise of the regional jet and jam-packed flight. Ahh...the golden days of flying. 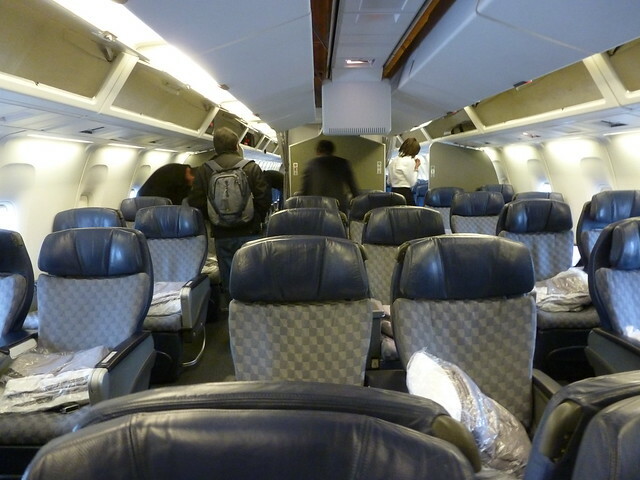 Later on, on certain 762s, there was a setup with 9 seats in 2-1-2 with only a single center aisle seat- I know I flew this configuration as I flew in 2C which was the only seat in the center of the cabin, and a strange seating experience. I remember the F cabin (which i had flown on the initial flight from JFK-LAX since first class was sold out) was the updated blue leather/fabric cabin of the 777- just without any screen/phone etc, yet the first class cabin had not been updated. I remember it was a gray leather though- not this black leather that I found a photo of. Also notice there was no sheepskin on these as that fad was out by 2007. I think the early 762 pre-ETOPs cert had only two classes- a taupe leather first class without sleepers in a 2-2-2 arrangement for 24, and then a coach in light blue fabric like many AA planes of the era. I have not been able to find pics or confirm though.. I flew on AA's 763's a lot around the mid 90s. LHR-MIA, LHR-LAX, LHR-RDU (miiight have been a 762) same config. JFK-GRU-GIG, many transcons. First was 2-1-2. Still had the sheepskin... 7 course meals that went on foreeeeever! I flew AA146 BOS-CDG & AA121 CDG-JFK on February 2001. BOS-CDG was on a 763 with the then new three class dark blue interior. CDG-JFK was on a 762 with the blue interiors in J & Y. F had the light brown leather seats with the red center headrests. American767 is right but is slightly off on the dates. All F seats on AA were beige leather in the 1980s (when they refurbished the cabins with baby blue coach seats circa 1982-1984 and put leather in F) but by 1990 they were changed to taupe on all widebodies in F/J with narrowbody F seats soon to follow. (The only exception was the 747SP which actually had baby blue leather and lambswool in F/J instead of taupe) 3 cabin aircraft got leather and lambswool F/J seats but two class aircraft F seats stayed all leather just with the new color. In 1995, American slightly altered F/J seats on 3 cabin aircraft by introducing an accent color on the seats with a rusty red colored center leather headrest and the lambswool was changed to this color too. You can actually see it in the second link from the FA training photo in your post 18. When AA started refurbishing S80s with the darker blue cloth seats in both F and Y with leather headrests around September 1999, these seats eventually went away, but F on 3 cabin 767s were among the last to go. I flew IAD-LAX in Spring 2001 on a 762 in F with 9 seats and it still had the taupe and red leather lambswool seats in F, but the bulkhead and Y and possibly J were already done with the new seats. In Home Alone 2 which is from 1992, they were already taupe as you can clearly see on YouTube below. Btw this has to be a mock cabin as no AA 767 had a door behind F and is likely a MD11 inside and has wider seats. I think that is midnight blue leather but not certain. I believe the lambswool was out by the end of 2001 or 2002, when did you last see it? The taupe leather seats in F on the 757 though stayed at least through 2012 though on some aircraft. This one looks like a movie studio set. Note the 747 sidewalls and 727? overhead bins. Did any other airline use Sheepskin seats in their premium cabins other than Pan Am and AA? This plane is built to withstand anything... except a bad pilot. Btw this has to be a mock cabin as no AA 767 had a door behind F and is likely a MD11 inside and has wider seats. The best footage shot on an actual airplane was the movie Bullitt (1968). Real cabin shots on a brand new Pan Am 707. The scene before this one walks through the entire cabin. You can see how new the plane was by the shine of the fuselage. 1) I think the seats from home alone/home alone 2 are actually different. They appear to be the weber narrowbody seats (featured in the 757 forever), just with a sheepskin insert rather than all leather. You'll notice there is no separate headrest, and the sheepskin insert has five thin layers rather than the two large layers on the 762 14 seat. 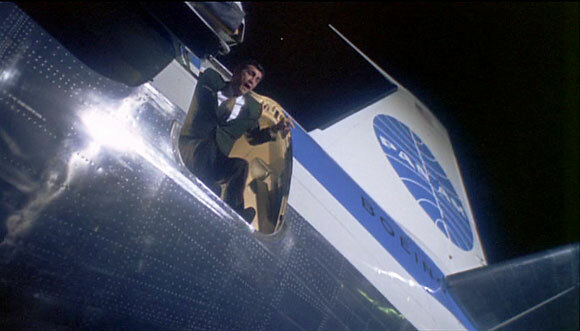 Interestingly enough, some people said that they filmed Home Alone on a 747SP mockup used for training, but since the SP had blue seats, I am not sure that is true- more likely filmed on a DC10 as it is clearly not a 767 from the windows alone. 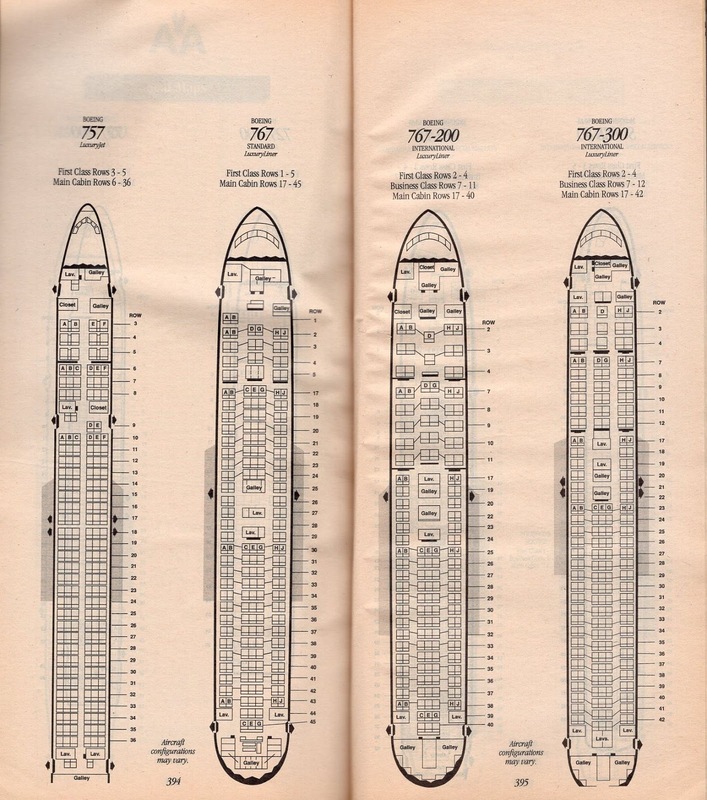 2) It seems the 762 was delivered with a 2 cabin, leather F and baby blue C. That is consistent with the seating chart. I am not sure what the F cabin looked like but I imagine similar to the 757's cabin for years. 2) It seems the 14 seat config was for the intl 762 routes featuring lambswool and 7 course meals from the late 80s to mid 90s- interestingly enough, that picture I linked above (and below again) was from the intro of the transatlantic service offering on the 762. I cannot remember where I found that picture but it highlights the 7 course meal as they are being served wine and cheese. 3) It seems that only 3 cabin 762s got the lambswool, but the strange thing is I remember seeing a pic of a gray fabric J seat which was different fabric from the baby blue fabric C at the time- it also featured wooden seat sides. Was this seat ever on the 762 or am i messing things up here? 5) You reference that the lambswool was red as well as the red headrest cover as of 95 and in that fa training shot. But the lambswool looks to be brown or greyish- Do you have any better photos of the red headrest days? And did those J seats have leg rests like the F seats? Last edited by wernerga3 on Thu Feb 14, 2019 2:32 pm, edited 1 time in total. Cool, never seen a picture of an AA SP cabin. I remember full size London Tube advertisements with those seats. IIRC, it was only a change of headrest color (and I think pitch increase) at the time. Was this seat ever on the 762 or am i messing things up here? Have you seen the pics in this thread ? That thread is great! It has the 762 setup I was referencing, but from the front! Those are the seats! Looks like the grey/beige whatever cloth J seats were on the DC10 but not on the 762; also seems that the J seats which were sheepskin 2-2-2- had the sleeper legs. Nice! I wonder if there is a copy of the tube advertisement with the red headrests.. Hard to find. What if those grey/beige cloth seats were in the original C section of the 762- There doesn't seem to be a good answer as to why they were grey/beige in some instances and blue in others- I mean AA did go crazy in the 70s with multiple color cabins in red white and blue, but it seems that fad was out by this period of the early 80s.. I think the seats from home alone/home alone 2 are actually different. They appear to be the weber narrowbody seats (featured in the 757 forever), just with a sheepskin insert rather than all leather. You'll notice there is no separate headrest, and the sheepskin insert has five thin layers rather than the two large layers on the 762 14 seat. Interestingly enough, some people said that they filmed Home Alone on a 747SP mockup used for training, but since the SP had blue seats, I am not sure that is true- more likely filmed on a DC10 as it is clearly not a 767 from the windows alone. That wouldn't really make sense though because only 3 cabin aircraft had the lambswool. 767 J seats were obviously more narrow since they were in a 2x2x2 configuration, even with the D10 and M11 having 2x3x2 in J. More likely it was from the D10 or M11 but I don't know about the separate headrest. Here is a video of the M11 cabin in 1994 showing J class starting at 5:00, it is not the best quality but you can clearly see the seats. I just watched the Home Alone video again. It is actually a 747SP or mock cabin. It actually looks totally real especially compared to the mock cabins in the training center pics. Perhaps DL Mechanic can tell, I didn't really see the doorstop thing in the pic he shares. You can tell by the window insets on the sidewalls and notice how wide the aisle is in Y. It would be even wider in J as it was only 2x2x2 (yet D10s and M11s were 2x3x2) on the SP. I am wondering if AA replaced the baby blue leather with taupe on the SP, even though they didn't keep them long they only had two so it couldn't have cost that much. When you said C I thought you meant Business instead of Coach. C was a universal booking code for Business Class before J was or at the same time. I think of coach as Y when using one letter. I flew both the 2 cabin 762 (DFW-SAN) and 3 cabin 762 (SAN-LAX) in January 1990. The 2 cabin one looked the same as the 757 interior and the 3 cabin one was all taupe leather and lambswool in both F and J. I have a pic of it somewhere, the F seat looks slightly darker but it could be the lighting it was a 7a departure I believe. I didn't know it was a 3 cabin ac until I boarded and my coach seat was actually in J. It was sold as Y and they came through with the beverage cart which continued into coach. It was flight 76 which continued onto IAD where it was sold as 3 class. It seems that only 3 cabin 762s got the lambswool, but the strange thing is I remember seeing a pic of a gray fabric J seat which was different fabric from the baby blue fabric C at the time- it also featured wooden seat sides. Was this seat ever on the 762 or am i messing things up here? I had never seen the wooden sides or the palm tree or whatever design on the sidewalls, I don't like them really. My favorite was the 767 sidewall with the blue pattern at the bottom that transitioned to more gray above the seat. I was glad AA kept it. It brightened their future more drab seat covers, especially the current J ones. You reference that the lambswool was red as well as the red headrest cover as of 95 and in that fa training shot. But the lambswool looks to be brown or greyish- Do you have any better photos of the red headrest days? And did those J seats have leg rests like the F seats? After seeing the mock cabin it refreshed my memory. The red leather headrest started with J only and it was several years IIRC until they put it in F too. I believe it wasn't until later the lambswool color changed too (99.9% sure it did but I could be wrong) and I remember it looking almost mauve. J seats definitely had the footrests from the beginning too, they just didn't extend all that much. Last edited by afcjets on Thu Feb 14, 2019 9:14 pm, edited 1 time in total. On the flip side, the 747 in 1983 had 2-4-2 in J, and it offered two different first class seat options. On the main deck in the A-Zone and front of the B-Zone were regular first class seats in a 2-2 setup (with 2 singular center chairs), and on the upper deck there were what appear to be different first class sleeper seats which are further spaced out. I have never seen any photos of the 747 first class from this era- only 747 photos from the early 70s when there were 2 lounges and swivel dining chairs in the cone and B-zone, so who knows what the seats looked like. Although I believe the regular 747 seats would be taupe and not the dark blue like on the SP. As for home alone, If it was a 747sp mock up, it could have been built with taupe leather, even though the real SPs had the dark blue. But those seats are def different. I am still trying to figure out how those all-in-one weber seats with the sheepskin insert fit into things. They don't appear to have the sleeper leg rests either. They are clearly different from the sheepskin 3 class 762 seats. The 747sp had 2-2 F sleeper seats in the A-zone, and 2-2-2 J seats for the majority of the rest of the cabin. It even had two bars in the middle of the plane, and upstairs there was a buffet table in the rear galley area of the upper deck! Sorry about the C confusion. Thanks for the info- I will refer to coach as coach from now on and business as J. As for the mauve lambswool, i am on the hunt for a picture. I believe your recollection and it would be likely that these were switched out as the lambswool didn't appear to hold up well for long periods. It's possible the F seats on the seat map are not exactly drawn to scale on the upper vs. lower deck. 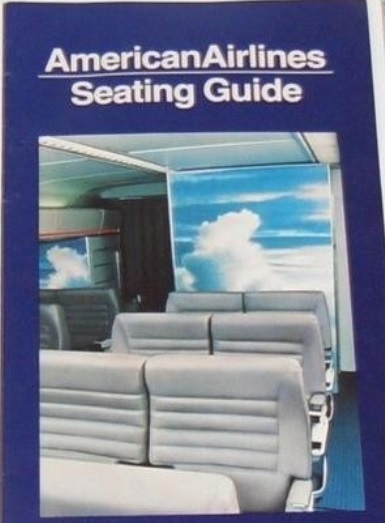 I believe AA switched to beige leather F seats and the baby blue and beige coach seats in 1983. All but two 747s were retired in 1984 and the last two in 1985, including one that wasn’t introduced until 1984 according to the link below (and of course excluding the two 747SPs from the early 90s) and it’s possible the last ones to go were reserved for charters. I doubt the 747s ever got new seat covers, just early business seats at 2x4x2 which are inferior to even Premium Economy today. Also, I wouldn’t call the 747SP F/J seats dark blue, they were bright blue and only slightly darker than the baby blue coach seats. I actually think it’s supposed to be the exact same color or pretty close. It may just may look darker as leather and/or in certain lighting. It looks strange on that upper deck pic, I remember seeing a pic of a brochure on their DFW-NRT service at the time showing the lower level and it looked much better, probably because it was so spacious down there at only 2x2x2, where you saw a lot more of the cabin than just those blue seats. AA leased a 747-100 from pan am so that they could make the march 2, 1970 inaugural flight ahead of the delayed delivery schedule. The initial AA 747s had a coach lounge in the rear (as did the DC10), but the pianos were not added until later in 1972, and went along with the luxury liner titling. The lounges in coach would be removed by the late 70s thanks to CAB pressure, and the seating changed from 9-10 abreast in coach. Then in the early 80s, I believe the AA 747s got one interior change to the leather sleepers in first, a new biz class section (which i have no idea what it looked like just that it was 2-4-2), and then coach- which could have been the new baby blue, or could have remained the same as original. There are pieces that i need to figure out still- but I am getting closer. As for the 747sp, that was from a local news article from 1987 talking about AAs entrance into the pacific market with the sp. Those sps were delivered to TWA originally in 1980- then AA got them in 1986 for the 1987 start of service. They showed the stewardess upstairs to tout the high luxury level of the flights. And like I said, there were sleeper seats, galley buffets, huge glasses of champagne, and even stand up bars on the main deck! Having said all of that, I have never seen the main deck. And I am curious what both the first class and biz classes looked like on the sp main deck since they were late 80s as compared to the 747-100s which were retired as you said by 85. If you have any photos of the main deck it would be great to see them! Totally off topic, but when you click on the link to this old thread from a few years ago I see that airline and airport codes are underlined and when you hover your mouse over them the airline/airport names appear. Why, oh why, did A-Net do away with this wonderful feature??? Anyway- to bring this thread back on topic, if anyone has any photos of the early 767 cabins for AA- I would really appreciate if you could share them! Found a better pic of the SP seats- I also did some research on the sheepskin era of AA because I have a strange interest in sheepskin era airplane seats. 1) DC10/762 Taupe Non-Sleeper Weber 6003- This seat was an evolution to the leather Weber 6003 seat which adorned the entire fleet's F cabin as of 1983. This was one of the most popular seats in an AA plane, and was used in the 757 for a very long time (in non-sheepskin form) after the rest of the fleet had been upgraded to the blue leather/cloth design of the 2000s. In the late 1980s, AA had added sheepskin to the Weber 6003 on wide-body planes. The narrow body planes retained the all leather seats in first. You can tell this seat because it has five tufts/layers on the seat-back- and you can see those same layers in leather or sheepskin form. 2) 747SP Blue Sleeper Weber- Not sure which model this seat is, but It looks to be a modified 6003. This seat was specific to the 747SP and was bright blue. It only had four tufts/layers on the seat back, but interestingly it had the tufts on the seat cushion as well. 3) DC10/762 Taupe Sleeper Weber 7502- This seat was used initially on trans-atlantic routes, but then was added to the flagship first transcon service in 1992. The seats were sleepers and featured two massive layered cushions covered in sheepskin. They also had separate adjustable headrests and mini tables for drinks. These seats were in 2-1-2 on the 762 and 2-2-2 on the DC10. 4) DC10/762 Taupe Sleeper Weber J Cabin- Again, not sure which model this seat was, but they were similar seats to the 7502 F seats, but featured less recline and narrower width. They would also get the red leather headrests later in their life span. These seats were 2-3-2 on DC10 and 2-2-2- on 762. 1) I think the seats from home alone/home alone 2 are actually different. Indeed, actually I found online a number of American Airlines ads that utilize these variations of the Weber seats. (I too am an old-AA-cabin-interior-nerd of sorts, did a fair amount of research on the matter too. I think more discussion needs to occur. I will PM you. I found an image of the wide-body A300 cabin- This is most likely what the original 1983 767 cabin looked like as well. Too bad there is still no imagery- and I have been looking hard! Wish I could find the video, but there was an American Airlines video online with a montage of photos from training (trying to remember if it was a graduation video that a person in said class uploaded) - in it, I commented about the 767 pics, one of which most likely being the original 1983 cabin - and being surprised to see the cabin with those seats (being so used to the sheepskin+leather ones)... to which I received a response about them (and learned a little about the configuration at the time)... now if only I could find that video. I remember my first flight on AA767 in F with family returning DFW-EWR mid 80s. There were cool new features like doors and coat closets that went up into the crown and large movie screen that flipped over for stowage. The pilot tuned the VHF to the Cowboys-Giants game on the 3-tube projector and kept retuning as we would change markets. Of all the things to worry about... the Wookie has no pants. Yeah I'd like to see the video! I found this rare picture of a 1985 AA seat guide on worth point- It's a DC10 indicated by the amount of rows of seats and the rear right coat closet which the 767 didn't have- but the 767 likely looked similar including those crazy fuzzy cloud graphics on the bulkheads! 3 cabin aircraft got leather and lambswool F/J seats but two class aircraft F seats stayed all leather just with the new color. That still begs the question of how the weber 6003 sheepskin seat (featured in Home Alone / 2) fits into the pic. Since the 3 cabin aircraft clearly had the 7502 sleepers. In 1995, American slightly altered F/J seats on 3 cabin aircraft by introducing an accent color on the seats with a rusty red colored center leather headrest and the lambswool was changed to this color too. You can actually see it in the second link from the FA training photo in your post 18. You can see it on the J cabin, but I still have not seen this on the F cabin anywhere! I flew F in 07 and it was not like this or the dark blue refresh the 300 got. 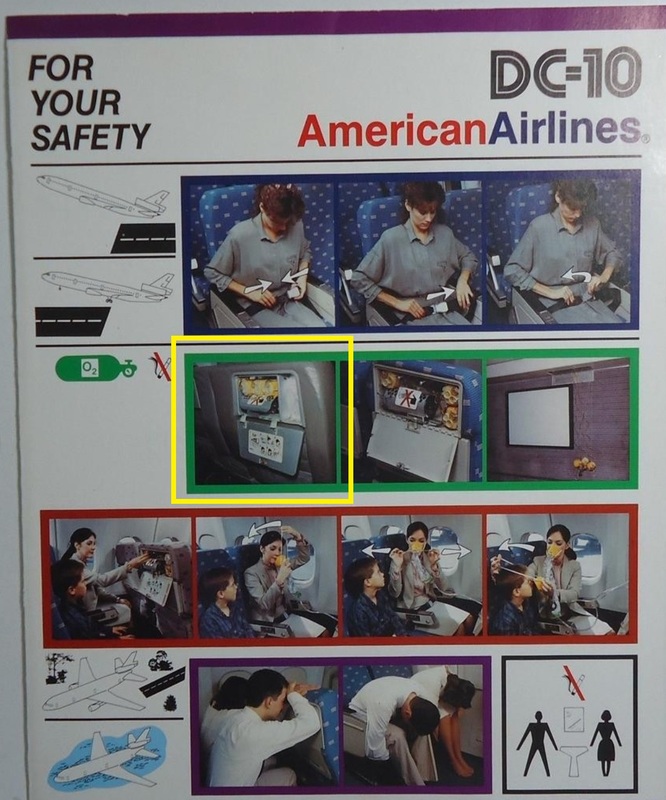 When AA started refurbishing S80s with the darker blue cloth seats in both F and Y with leather headrests around September 1999, these seats eventually went away, but F on 3 cabin 767s were among the last to go. I flew IAD-LAX in Spring 2001 on a 762 in F with 9 seats and it still had the taupe and red leather lambswool seats in F, but the bulkhead and Y and possibly J were already done with the new seats. For me, the overhead bins design, ceiling panel layout, and lack of middle bins gave it away... wow, never saw that pic before, nice find! Maybe my memory is fuzzy... a few times in the early-mid 2000s, I was lucky to fly JFK-LAX (and back), and JFK-SAN (and back) in J on the 767-223ERs in the early-mid 2000s, but didn't these seats (the ones that replaced the "Woolly Mammoths" in J, I mean) once have reading lights between seats? I seem to remember one flight with them, and another where they weren't there later on. Last edited by travelsonic on Thu Feb 28, 2019 5:35 pm, edited 2 times in total. Pardon the double post, twas accidental, but since it is here, I might as well use it. Looks like a ... mockup, but of what type? DC-10 was my initial thought, but upon looking closer, the windows look more 767-esque... but were 767s without the blue wall paneling being delivered by then? Either way, interesting perspective of the J (?) cabin legroom. 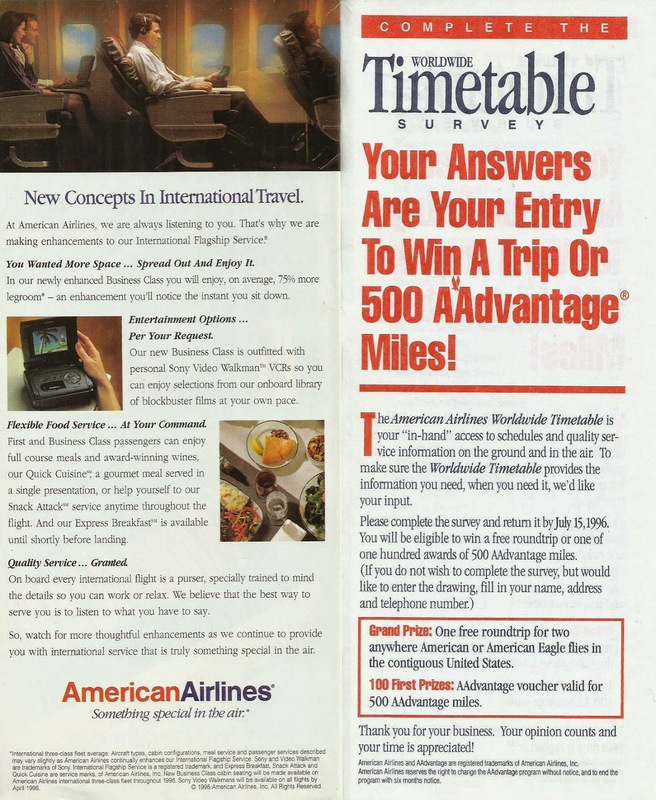 Here's an image from a 1994 timetable, ad for American's transcon Flagship Service with an image of the seat, and what looks like a mockup of the DC-10's F or J.